Waiting and patience seem antithetical to the speed involved in winning a bike race. These two actions – or inactions – also exist in opposition to American culture, which teaches that success arrives when a person is a “go-getter,” not a waiter and certainly not a hesitator. “He who hesitates is lost”. But in fact as Andersen and Gogulski say, waiting and patience are not antithetical to bike racing. 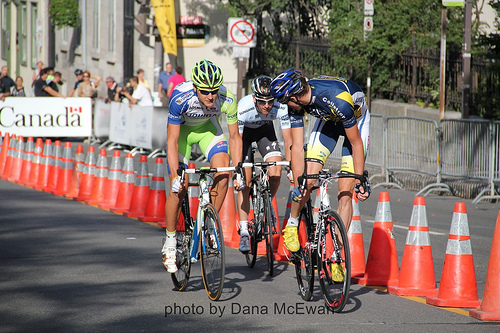 Track racing, a discipline that didn’t attract my attention until I saw last Thursday’s Grand Prix Cycliste Challenge Sprint, is a more obvious example of how cyclists use these two tactics. Just after the turn in the out-and-back Challenge Sprint course, with 500 meters to go to the finish line, most groups of three or four competitors slowed to a crawl, some close to track-stands, to watch each other. And wait. It can feel excruciatingly painful to wait. It’s uncomfortable. To the rescue comes another cliché: “All good things come to those who wait.” Almost all, if not all, pro-cyclists lose many times before they win. The cycle of racing, and racing, and racing some more is akin to waiting. Waiting becomes a trait our culture admires: perseverance. Ryder Hesjedal knows about waiting. In an article about Ryder published in The Walrus, “The Pain Principle,” he said, “You have to not be able to do it a hundred times to be able to do it a few times.” Meaning, you won’t come in first until after you’ve lost a hundred times. Will Ryder cash in his hundred tomorrow in Montréal?